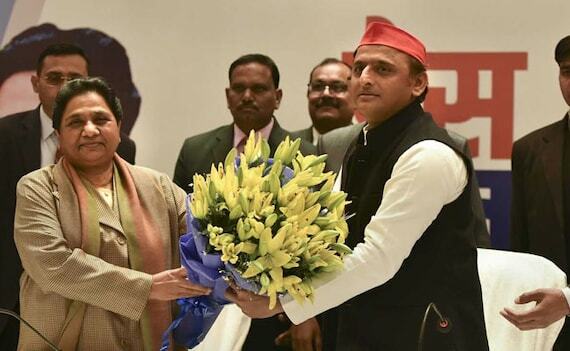 Once fierce rivals, Akhilesh Yadav and Mayawati today announced an alliance in Uttar Pradesh for the national elections that are expected to take place in about three months. The two parties, which were wiped out in the 2014 general election, said they will contest on 38 seats each of the state’s 80 Lok Sabha seats, keeping their personal differences aside to end “the monstrous rule” of the BJP. “Uttar Pradesh has produced numerous prime ministers in the past. You know whom I will support. I will be happy if another prime minister comes from the state,” Mr Yadav said, when asked whether he will support Mayawati for PM. Mayawati, however, deflected questions on whether she would contest the Lok Sabha polls or not. “In due time, you will be informed of this also,” she said, smiling. Last month, when DMK chief MK Stalin had proposed Congress president Rahul Gandhi’s name as the opposition’s prime ministerial candidate, it was shot down by the entire opposition bloc, including Akhilesh Yadav’s party. The parties said such decisions should be taken by the opposition parties only after the polls. “The alliance was in my mind since the day BJP leaders made obscene comments on Mayawati. Instead of punishing them, BJP gave big ministries to these leaders. From today onwards, all the SP workers should know that disrespect of Mayawati, will be my disrespect,” he added. Mayawati, the four-time Uttar Pradesh Chief Minister, said they would give anxious and sleepless moments to the “guru-chela” duo of Prime Minister Narendra Modi and BJP President Amit Shah.